Jeff Corey's memoir is now available. 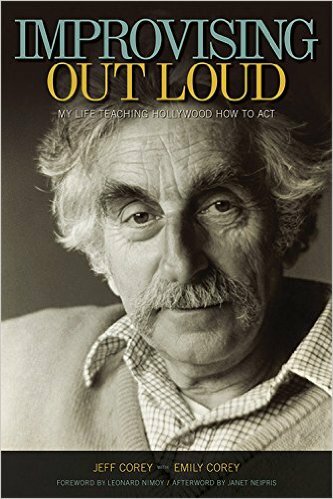 "Improvising out Loud: My Life Teaching Hollywood How to Act"
Jeff Corey's career began in Shakespearean repertory in New York. In 1937 He played Rosencrantz in Leslie Howard's Hamlet. Subsequent N.Y. productions included Life and Death of an American, and Transit. Corey came to Hollywood in 1940 and helped establish the Actors Lab, under whose aegis he performed in Abe Lincoln in Illinois, Declaration, Miss Julie, To The Living, Prometheus, and also produced Juno and the Paycock. He toured with Ann Sothern in God Bless Our Bank, and played Alfieri in the La Jolla production of A View From the Bridge. Mr. Corey also performed in a production of In the Matter of J. Robert Oppenheimer, at the Mark Taper Forum, and played Polonius in the Taper's production of Hamlet. In describing Mr. Corey's performance as King Lear at the North Shore Playhouse in Massachusetts, Pulitzer Prize winning critic William Henry III wrote, "In the part Charles Lamb called unplayable, he is magnificent." Corey has appeared in over a hundred features, including Home of the Brave, The Devil and Daniel Webster, My Friend Flicka, Bright Leaf with Gary Cooper, Joan of Arc with Ingrid Bergman, The Killers, Brute Force, Butch Cassidy and the Sundance Kid, Seconds, Mickey One, Getting Straight, The Cincinnati Kid, In Cold Blood, Beneath the Planet of the Apes, Bird on a Wire, Color of Night, and Surviving the Game. He has also performed in True Grit and Wake of the Red Witch, with John Wayne, as well as delivering a memorable characterization of Wild Bill Hickock opposite Dustin Hoffman in Little Big Man. On television Jeff Corey was a regular on NBC's Helltown, and the CBS series Morning Star/Evening Star. He has made guest star appearances in Star Trek, Roseanne, Barney Miller, Knott's Landing, Baba, Gunsmoke, Archie Bunker's Place, Outer Limits, The A-Team, Rawhide, Night Gallery, Hawaii Five-0, Jake and the Fatman, Kojak, One Day at a Time, Babylon Five, and Lou Grant. In 1976 he played Andrew Jackson in the bicentennial Land of the Free. As a director, Corey has amassed such credits as The Psychiatrist, Night Gallery, Sixth Sense, Alias Smith and Jones, Sons and Daughters, Meeting of the Minds for PBS, as well as Anna and the King, with Yul Brynner. Mr. Corey's Professional Actors Workshop, attended for many years by Hollywood's most talented actors, directors, and screenwriters, has been described by Washington's The National Observer as, "A major influence in the motion picture industry." He was appointed Professor of Theater Arts at California State University in Northridge, and was artist in residence at Ball State, in Indiana, The University of Illinois in Bloomington, Chapman College's World Campus Afloat, the University of Texas in Austin, and the Graduate School of Creative Writing at N.Y.U. He has conducted seminars at Emory University in Atlanta, and for the Canadian Film Institute in Vancouver, British Columbia. Jeff Corey was also awarded three citations for his work as a motion picture combat photographer in World War II. In October 1945 he received a citation from Secretary of the Navy James Forrestal and Captain Edward Steichen with the following commendation, "His sequence of a Kamikaze attempt on the Carrier Yorktown, done in the face of grave danger, is one of the great picture sequences of the war in the Pacific, and reflects the highest credit upon Corey and the U.S. Navy Photographic Service." the 1950's. They include James Dean, Anthony Perkins, Jane Fonda and Jack Nicholson. Perhaps best-known for his post-blacklist roles in "Butch Cassidy and the Sundance Kid," "In Cold Blood," "Little Big Man" and on the TV sitcoms "One Day at a Time" and "Night Court," Corey died Friday morning at St. John's Medical Center in Santa Monica of complications from a fall earlier in the week at his home in Malibu. To generations of actors, directors and writers, Corey's name on the blacklist didn't mean a thing. They came to his informal classes for his insightful ideas on the craft of acting and views on how to handle challenging roles. His list of students makes up a who's who of the Hollywood elite since the 1950s and includes James Dean, Anthony Perkins, Shirley Knight, Jane Fonda, Peter Fonda, Robert Blake, Leonard Nimoy, Robin Williams, Rob Reiner, Robert Towne, Roger Corman, Penny Marshall, Taylor Hackford and a young Jack Nicholson. "Acting is life study, and Corey's classes got me into looking at life as an artist," Nicholson said years later. Those who knew Corey's teaching process said he was a Stanislavsky Method teacher but with a small "m." His process was eclectic and involved one-on-one work with an actor. He created improvisational exercises that allowed actors to engage their imaginations and subconscious minds in pursuit of a theme that they could apply to their roles. Corey was always pursuing a current underlying emotional and psychological theme in the actor's work. And in doing that, he was trying to help the actor relate to the here and now rather than the arcane notion of the character's circumstances. "I tell my students, 'Respect the instrument. It is you doing the acting,' " Corey told The Times some years ago. "By all means, you must be responsive to the meaning of the play, to what the author meant and to what the audience will ultimately see. Engage your own intuition, use your own frames of reference and give something which is uniquely yours; put something rich into your performance rather than some external result that hasn't got your face. Simplicity is the cherished quality." Corey didn't set out to be a teacher. An indifferent student in high school in New York City, he took a drama class and became intrigued with acting. He earned a scholarship to the Feagin School of Dramatic Arts, then a leading theater school in New York City, which he later said kept him from a career selling sewing machines. From there, he did work in Shakespearean repertory and then worked with a traveling children's theater troupe. His first meaty stage role was in Leslie Howard's touring production of "Hamlet," in which he played Rosencrantz. Corey and his wife moved to Los Angeles, and he found work, appearing in 23 films from 1940 to 1943, including "The Devil and Daniel Webster," "My Friend Flicka," and "Joan of Arc." He joined the Navy in 1943 and was assigned to the ship Yorktown as a combat photographer. He earned citations for some footage he shot during a kamikaze attack on the ship. After the war, Corey returned to Hollywood and resumed his busy career playing heavies in such films as "The Killers" and "Brute Force." He also played the role of a psychiatrist in "Home of the Brave," one of his best performances. Corey seemed ready for even better film parts as the second lead or top character actor, when he was subpoenaed to testify before the House Committee on Un-American Activities, which had been investigating Communist influence in Hollywood since 1947. The actor was scheduled to appear at the hearing in downtown Los Angeles in September 1951. He was 37 and had a wife and three daughters to support. But he took the 5th Amendment and didn't work again as an actor in Hollywood for more than a decade, missing out on countless movie opportunities and what would later be considered the golden age of television. "Most of us were retired reds. We had left it, at least I had, years before," Corey told Patrick McGilligan, the co-author of "Tender Comrades: A Backstory of the Hollywood Blacklist" who also teaches film at Marquette University. "The only issue was, did you want to just give them their token names so you could continue your career, or not? I had no impulse to defend a political point of view that no longer interested me particularly .... They just wanted two new names so they could hand out more subpoenas." He found work as a laborer earning $14 a day and enrolled as a freshman at UCLA on the GI Bill. He eventually earned a degree in speech therapy. Corey would later say that he fell into teaching somewhat by accident. He said a student who was failing miserably in another program organized the first class and talked him into teaching it, which he did in the garage of his Hollywood Hills home. Carol Burnett, then a freshman at UCLA, was among the students. Word of mouth kept the classes going as Corey, a self-effacing man, didn't promote himself or advertise and did little to encourage enrollment. By the mid-1950s, he was the most sought-after acting coach in Hollywood. Studios that would not hire Corey as an actor because of the blacklist actively sent their young talent to study with him. Corey himself wouldn't start working again in films until 1962, when he was offered parts in the films "The Balcony" and "The Yellow Canary." One of his students, Pat Boone, helped him get the part in "The Yellow Canary" by talking the legal department at Fox into taking him on.Over the next 35 years, Corey appeared in more than 70 films or television series. He also got chances to direct. According to McGilligan, Corey was "an actor's actor, someone that actors loved to watch because he was always doing something interesting in his work." "Jeff was articulate about ideas, provocative and inspirational," McGilligan told The Times on Saturday. "He was a wonderful actor who we never fully got to see because of the blacklist." Corey is survived by Hope, his wife of 64 years; three daughters, Eve Corey Poling of Atlanta; Jane Corey of Elk, Calif., and Emily Corey of Los Angeles; and six grandchildren. Lady in a Cage (1964) .... George L. Brady Jr.